Unfortunately, there’s more to this story. After a years-long relationship with Kate & Ellen, it turns out that not all they present to the Internet world is true, very little of it actually. Read a review of their (lack of) craftsmanship and other qualities they seem to present in this article here at The Modern Caravan Scam. TLDR; They stole from us, left us with a half-completed project, and generally just screwed us over. That’s how Kate and Ellen, also known as Birch and Pine in the Internet world, describe themselves on their Instagram account. 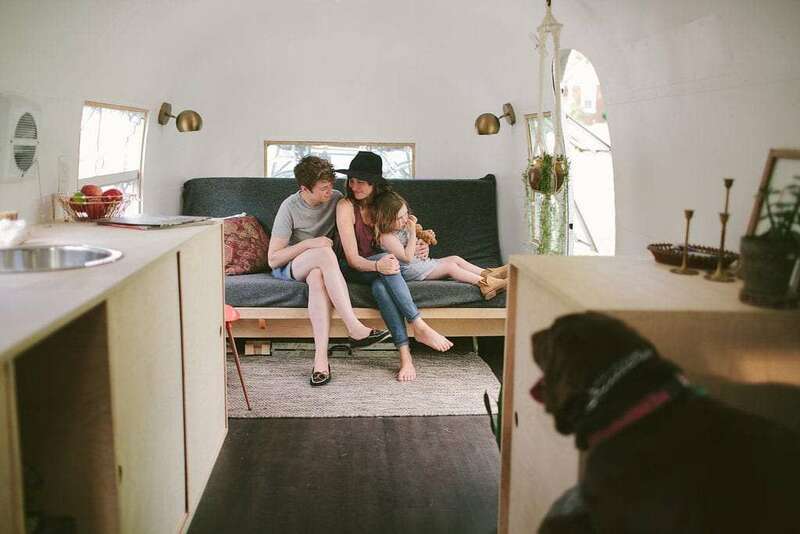 We’ve been following along with their journey as they’ve transformed their vintage Airstream into a work of roving grandeur that, through the photos they share, seems to exude a feeling more akin to slow sunlight dripping in through curtains of a sleepy farmhouse than an aluminum trailer. Barely 30, they’re the latest addition to this long road full of young travelers wakening to the possibilities of what a modern era of cell phone connectivity and less traditional workplaces makes possible. 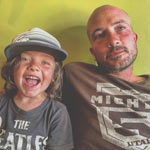 And with five year old Adelaide along for every minute of what will surely prove to be a life changing excursion for all of them, they’re a most welcome addition to the ranks of young families learning how much time, love and experience you gain from traveling with kids. Our travel dreams were born out of finding home. From the edge of a lake somewhere in Ontario, they shared their story. “We were noticing a significant discontent in our lives,” Kate begins, “as artists, our creativity was suffering greatly, and we easily traced this back to our city, a place where we never quite felt at home or at ease.” Before leaving in May of 2015, Kate and Ellen lived in Kentucky, and as a gay couple found their community less than accepting of who they are. “Ellen was really ready to focus on creating art instead of teaching it,” Kate continues. Ellen was an art teacher at a local high school for the past seven years. The same high school she herself graduated from, just down the street from where she grew up. Making a decision and making a decision actually happen are two very different parts of an adventure, though. For some people, it’s clear what they want to do. Travel to a particular place or live in a specific way. It seems that what Kate and Ellen were looking for, however, was more about making a discovery than focusing on any one particular dream. We couldn’t have done it if we hadn’t done it together. When the idea that they would try and discover this all through traveling began showing signs of actualization, they first contemplated renovating a school bus or older RV. After looking at pricing and considering what might be best for Adelaide as well, they started investigating vintage trailers. Kate a natural designer, she and Ellen’s talents seem to be a perfect pair for such a project. “There’s a common misconception,” Ellen goes on, “that I work alone on the Airstream while Kate’s just drinking a beer and taking pretty pictures. However, I like beer too–and Kate works just as damn hard.” Picture them smiling and holding hands, something that, misconception or not, seems to be as essential as breathing is to the rest of us. It wasn’t all keg stands and pretty pictures, though. When you tear everything out of a trailer and essentially start from scratch, well, you’re bound to learn a thing or two on your way to becoming your own general contractor. As mentally trying as the renovation may have been, the hard work was no doubt just as tough. Many people would look at it and struggle and wring their hands and give up, or pay someone else to do it or slap it all together. Kate and Ellen are clearly defining themselves as willing to go far beyond what “many people” would. One can almost picture them, covered in dirt, grease and aluminum shavings, racing against time, frantic movements, triumph, and then sliding back down those sleek silver walls to wipe one another’s brows before looking around to the next project. Keep in mind that all the while they’re still mothers. Working mothers. Who were selling their house and everything in it. But they persevered to achieve their dream, to give themselves a pristinely comfortable and elegant place to reside as they begin their trek. And so, exactly a year to the day they’d initially purchased their Airstream, they were headed down the road watching it follow diligently behind in the rearview. Now that they’re traveling, Kate says that Ellen won’t need to work initially. “She’s taking this time to hone her love of woodworking and newfound love of moving pictures, yet won’t necessarily be taking a job on the road–at least not yet.” Ellen is barely 29. Do the math and you’ll realize that she’s spent eleven of the past fifteen years in the same school, either as a student or a teacher. So they’ve set aside some space in their Airstream for Ellen’s work. Running a woodworking shop out of a hundred square feet or so of home on the road might seem challenging to anyone who’s spent anytime in a travel trailer. While Ellen takes the time to explore her artistic tendencies, hone her skills, and as they all get acquainted with life on the road, Kate will continue her career as a freelance photographer and writer. A recent post on their blog shows that things are going swimmingly. Smiles wider than the distance between their former Kentucky home and their first destination in Canada, all three of them, show that they’re slowing into this life quite wonderfully, Adelaide in Ellen’s left arm, Kate wrapped around her right. Family after traveling family will attest that, compared to living in a large house where people are comfortable staying inside, lazing around, the smaller the living space the more likely it is that kids will get outside and play. Adventure, explore, seek out things that they wouldn’t have had the opportunity to know without being constantly pushed out the door and shown new landscapes as their parents circle the globe. Real experiences. Hands-on ones that show a kid what a frog feels like, what an owl sounds like, how a freezing river feels so good on a hot summer day. Experiences that glass screens and Nick Jr. are largely replacing for many children in society are as common place for traveling kids as they were for the millions of generations that came before this modern age. But how does one take a young child from a large house full of toys and “stuff” and convince her to load up into an Airstream? Adelaide was allowed to choose which toys and clothes she could keep and which would be donated, and was also encouraged to help with the Airstream renovation as well. They wanted her to know that, though things are changing, it’s for the better, and it’s not just Kate and Ellen’s dream but one that will trickle down sparkling to the entire family. And so how has she weathered the transition? As Adelaide moves toward an age where most children will start going to kindergarten, the couple has plans to approach her education as they’ve done with their new life–with what works best for them. “Kate taught her some at home this past year,” Ellen mentions, “but Adelaide set the pace of learning. “However, we do plan on homeschooling this coming year.” Ellen goes on to indicate it will likely be closer to unschooling than anything traditional. The family is already learning. Learning that life on the road, one spent intentionally living instead of following a prescribed path that so much of our society just buys into blindly, is a constant experiencing that evolves ones mind, their habits, their needs. Minimalism, living simply and travel often go hand in hand. Those who seek one often find another as a necessity, or a built in benefit. As with the Airstream renovation, finding this simpler way of living has not always been easy for the couple. “We enjoy hard work, and know that in our journey, we are finding daily purpose in working to truly live. We work for nourishment, we built our home, we wash our clothes in enameled basins. We didn’t fill our Airstream with every fancy amenity, in fact, we kept it pretty bare bones in order to push our limits and really work for things we want and need.” Kate and Ellen seem to have learned, even before hitting the road, that there is a great sense of satisfaction to being involved in the every little aspects of our lives. Where many people turn a knob and hot water comes out, travelers need to fill their water, light their hot water tanks. You become aware of how much power you’re using, how steep a hill is, how far is too far and how it feels to be truly cold in the winter and hot in the summer. This is part of the overarching quest they’re on to find their home, themselves. The family is currently spending a couple of weeks in a family cabin. 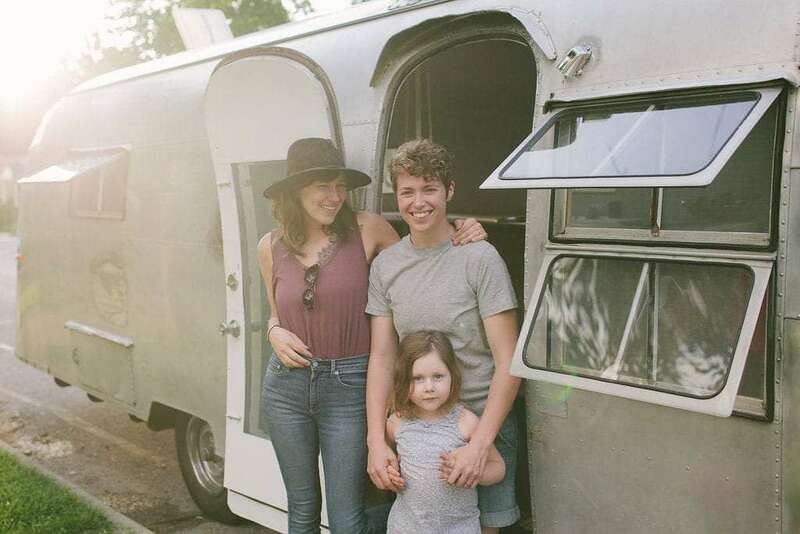 They needed some time away from their Airstream, which though they’ve only been in for a few weeks, has been a focal point of their lives for the past year as they toiled to ready it enough to hit the road. “We hadn’t even had a chance to really process our imminent leave,” tells Kate, “and then suddenly, it was happening. 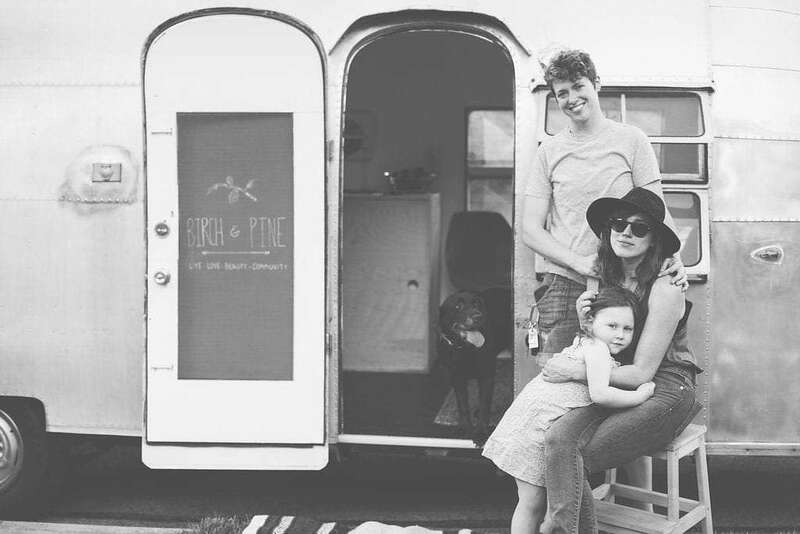 Thanks Birch & Pine, for turning us on to this sweet story of a motorcycle, the man and woman who drive it, and their vintage trailer. “The feelings were varied. Ellen’s stress about finishing the Airstream manifested in odd, unfamiliar and out of character ways, like anger and turning inward.” Kate also suffered, three panic attacks to be exact. Other conversations, with similarly beautiful people like Marlene of the Mali Mish crew, helped them through the more trying times. 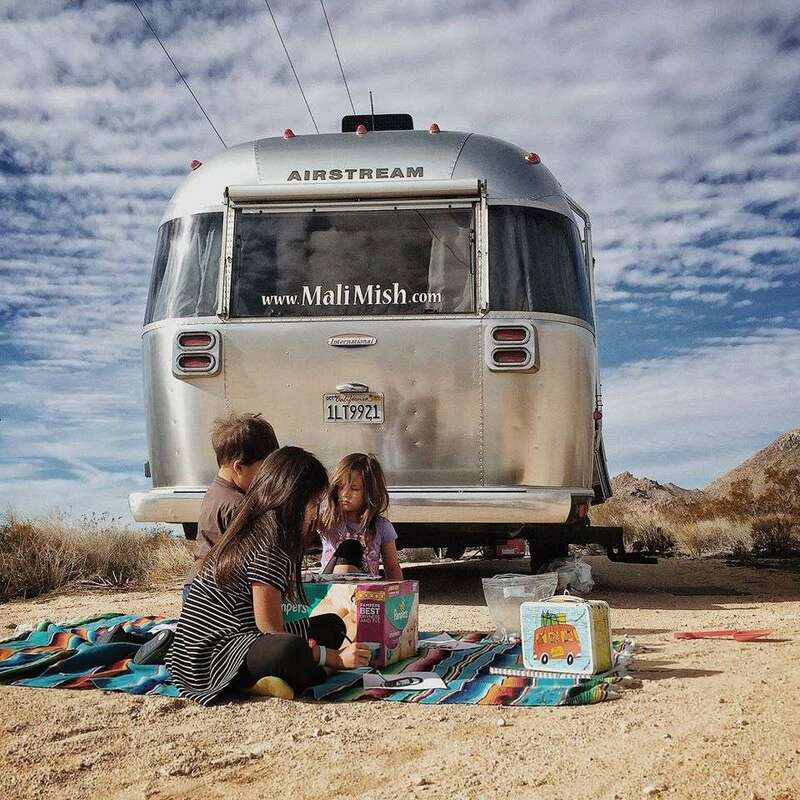 If you love the idea of full-time travel but haven’t heard of the Mali Mish crew, you’ll love the story of this beautiful family of five who’ve been traveling in their Airstream for years. And so the struggle, the labor, the mindset shifts, the uncertainty, has boiled over the pot of their old life and is now careening down the path to wherever the road may lead them. So what’s next? The Pacific Northwest for the summer. Christmas with Kate’s family in Southern California and maybe winter out the cold northern weather in the southwest. It’s an exciting time to have your entire adventure ahead of you, and know that it doesn’t need to be rushed. They plan to boondock when possible, thanks to help from sites like Campendium, and visit the state and national parks. Maybe do a little Harvest Hosting. Campendium is a website created by travelers for the rest of us. More than just a campground finder, it’s an essential tool for those of us who love boondocking, staying in national forests and finding out of the way places to call home on the road. Very sound and grounded thinking from someone only on the road for a short time. Often, the beginning part can feel like a dream, such a change in lifestyle that’s it’s hard to keep your eye on the realities that come with daily setting up and tearing down of your home, of moving miles away and finding yourself a new place to explore, yes, but also a new town to discover the intricacies of everything from where to buy milk to how to get around. Luckily, these days there is an already large and ever growing support mechanism: the traveling community. Part of the reason Kate and Ellen took to travel was that they found their previous life and community specifically the opposite, alienating. It’s only slightly ironic that a community which defies the traditional notion of “a bunch of people living in the same place” would be where they found a place to feel more at home. Kate plans to continue her work as a photographer and writer, hopefully with brands that fall nicely into alignment with their own values. “Being mobile is definitely a perk,” Ellen is speaking to how traveling compliments her partner’s skills, “as Kate is mainly working as a storytelling/brand photographer and the versatility adds a little something extra to her resume.” With two such companies already as clients, they’re off to a great start. Meanwhile Ellen will continue to pursue her Masters in Art Education. They’ve also been working on creating a, “small, beautifully curated online shop,” as they put it. “But we’re keeping the details of that to ourselves for now,” Ellen belies. 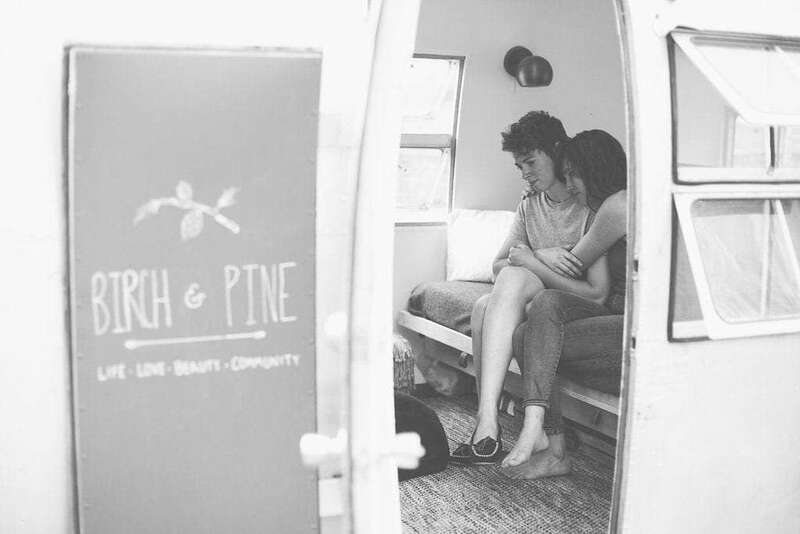 Hitch a ride with the entire Birch and Pine crew via the beautiful photos and insights on their blog, or just tap into the daily visual tidbit on their Instagram account.